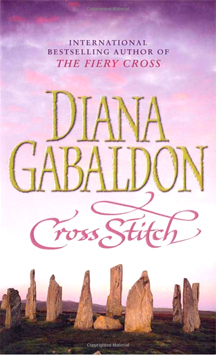 OUTLANDER (also published in the U.K. under the title "CROSS STITCH") is the best-selling first novel in my Outlander series of books. It was first published in the U.S.A. in 1990. Frankly, I’ve never been able to describe this book in twenty-five words or less, and neither has anyone else in the twenty years since it was first published. I’ve seen it (and the rest of the series) sold—with evident success—as <deep breath> Literature, Fiction, Historical Fiction, Historical NON-fiction (really. Well, they are very accurate), Science Fiction, Fantasy, Mystery, Romance, Military History (no, honest), Gay and Lesbian Fiction, and…Horror. (Really! One of my books beat both George R.R. Martin and Stephen King for a Quill Award in 2006.) Anyway, the only way I’ve ever found of describing this book to anyone is to begin telling them the story. So here goes…. In 1946, after WW II, a young Englishwoman named Claire Beauchamp Randall goes to the Scottish Highlands with her husband, Frank. She’s an ex-combat nurse, he’s been in the army as well, they’ve been separated for the last six years, and this is a second honeymoon; they’re getting re-acquainted with each other, thinking of starting a family. But one day Claire goes out walking by herself, and comes across a circle of standing stones—such circles are in fact common all over northern Britain. She walks through a cleft stone in the circle….and disappears. Back into 1743, where the first person she meets is a gentleman in an 18th-century army officer’s uniform. This gentleman, Jack Randall, looks just like her husband Frank—and proves to be Frank’s six-times-great-grandfather. 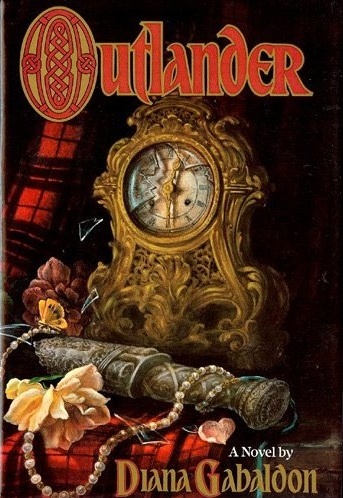 Unfortunately, he also proves to be a sadistic bisexual pervert, and while trying to escape from him, Claire falls into the hands of a gang of Highland Scots, who are also trying to get away from Black Jack Randall—though for other reasons. I’ve never lost any money on that bet. 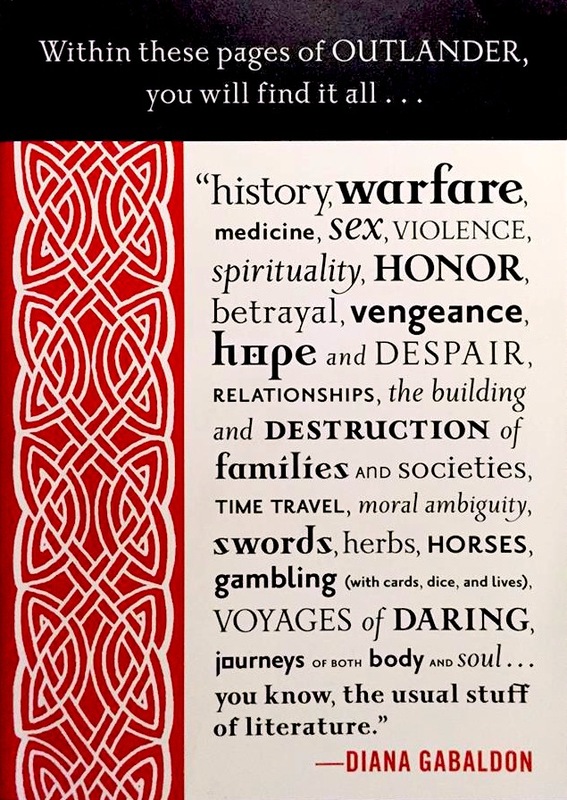 Why Did I Write OUTLANDER, My First Novel? 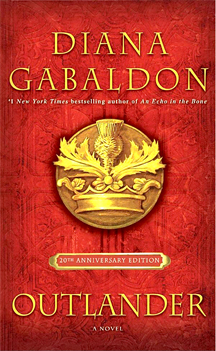 Click to read more about how and why I wrote OUTLANDER in my blog from 2014, "26 Years Ago Today…"
After OUTLANDER, I wrote multiple major novels in which the relationship between Jamie Fraser and Claire Beauchamp Randall Fraser is a main theme, and they are called the OUTLANDER series of (major) novels. 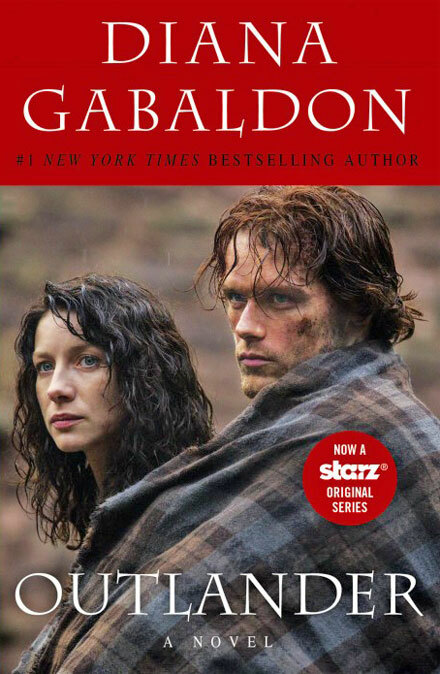 The eighth (and latest published) novel in the OUTLANDER series, WRITTEN IN MY OWN HEART’S BLOOD, was first published in the U.S.A. (and other selected global markets) in June, 2014. 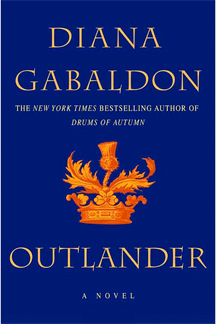 I am currently working on the next book in the OUTLANDER major novels, which is so far untitled. (And no, I DON’T know yet when I will finish it… probably in 2017. Stay tuned.) Click here for the Book Nine webpage, which includes current information and excerpts (aka "Daily Lines") from the new book. 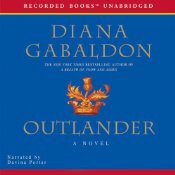 The Big, Enormous Books that have no discernible genre (or all of them), aka the "OUTLANDER Series of Major Novels." The Bulges— These being short(er) pieces that fit somewhere inside the story lines of the novels, much in the nature of squirming prey swallowed by a large snake. These deal frequently—but not exclusively—with secondary characters, are prequels or sequels, and/or fill some lacuna left in the original story lines. Want to know how all these stories and novels are related in time and my suggested order to read them in for the first time? 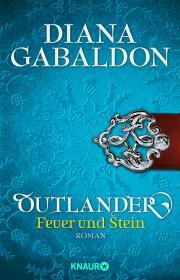 Click here to check out my "Chronology of the OUTLANDER Series." The books in the OUTLANDER series have sold over 20 million copies worldwide, and have been translated into more than twenty languages. Ron Moore of Tall Ship Productions, the Starz cable network, and Sony have created and produced a TV series based on the OUTLANDER series which premiered in the U.S.A. on August 9, 2014. Click here for selected news about the TV series. 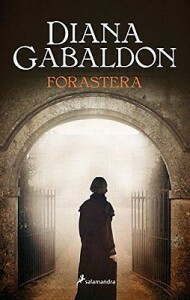 At upper left is an image of the paperback book cover of the reissue of OUTLANDER in 2014, with an image from the new Starz TV series. Forastera (Spain, Spanish Edition). Translates into English as "Outsider." 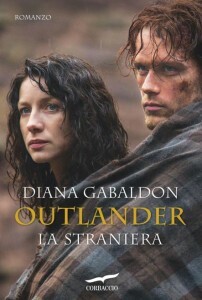 La Strainiera (Italian Edition). Translates into English as "The Foreign." 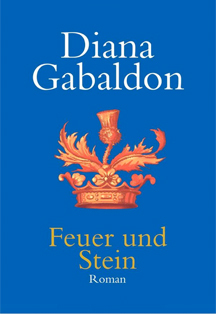 Feuer und Stein (German Edition). Translates into English as "Fire and Stone." If you live outside of the U.S.A., please check with your local bookseller or favorite online store for the release dates and editions available in your area. Click here for general information on global publication dates. This page was last updated on Saturday, March 19, 2016, at 1:17 a.m. (PT). Please send any comments about this webpage to Diana’s Webmistress.